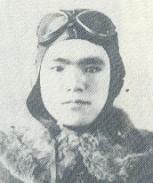 On May 25, 1945, Corporal Matsuo Masubuchi took off from Bansei Air Base as a member of the 432nd Shinbu Special Attack Squadron and died in a special (suicide) attack west of Okinawa at the age of 21. He piloted a Type 2 Advanced Trainer. After his death in a special attack, he received a four-rank promotion to Second Lieutenant. He was from Tochigi Prefecture and was a member of the 14th Class of the Koga Pilot Training School in Ibaraki Prefecture. I think that this letter will be the last. There is nothing to write. Be in good health. He also wrote the following death poems in tanka form (31-syllable poem with a syllable pattern of 5-7-5-7-7). Based on the poems' contents, the first two may have been written prior to his assignment to the Special Attack Corps. Takashi, I definitely rely on you! When I think back about you, at Koga we improved our skills together in the same glider unit, and at Sendai in the same section we shared together joys and sorrows. At Ping'an (in Manchuria) we parted. As inseparably bound comrades, we were selected together for the Special Attack Corps, and we will be together even when we fall. Together let's do our best. The letters and poems come from Naemura (1993, 158). The biographical information in the first paragraph comes from Chiran Tokkō Irei Kenshō Kai (2005, 164), Naemura (1993, 158), and Osuo (2005, 207). Chiran Tokkō Irei Kenshō Kai (Chiran Special Attack Memorial Society), ed. 2005. Konpaku no kiroku: Kyū rikugun tokubetsu kōgekitai chiran kichi (Record of departed spirits: Former Army Special Attack Corps Chiran Base). Revised edition, originally published in 2004. Chiran Town, Kagoshima Prefecture: Chiran Tokkō Irei Kenshō Kai. Naemura, Hichirō. 1993. Rikugun saigo no tokkō kichi: Bansei tokkōtaiin no isho to isatsu (Army's last special attack base: Last letters and photographs of Bansei special attack corps members). Ōsaka: Tōhō Shuppan. Osuo, Kazuhiko. 2005. Tokubetsu kōgekitai no kiroku (rikugun hen) (Record of special attack corps (Army)). Tōkyō: Kōjinsha.